All DJs and producers around have at least one secret weapon to play. This series curated by Marvin & Guy is the Equation that joins together very special edits from very special artists. It will be out in three volumes in different colours: first black, second grey and third white. 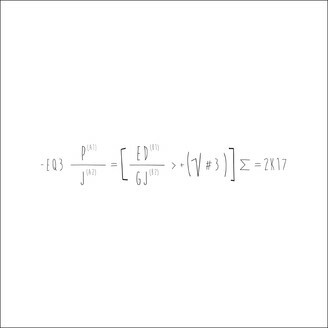 The Equation series are being released exclusively on vinyl, a limited edition of 300 copies; no digital formats will be released, and distributed by Kompakt. With Equation 3 the A-team is back once again and they have changed players for this third and last half. This time they bring along the ́Madrileño ́ who mixes movie trailers as well as house classics, the Frenchie living in the big Apple who once started his career rocking the piano at the Conservatory, The German who makes compilations of weirdo 80ies jams in his spare time and the Irish guy living in the land of the round butts nowadays, but once ruled the NYC disco scene fully on his own.